We were delighted to have the opportunity to meet current and new customers from all over the world. We would like to thank everyone who came to visit us and thank you to DCAT for organizing this incredible and successful event. We already look forward to next year’s DCAT Week! From left to right: Damien O’Rourke (VP and COO), Luc Miron (VP of Business Development), Ken McCracken (President and CEO), Robert Tyler (Director of Business Development) and Gearoid O’Rourke (Director of Sales and Marketing). *Kindly note that BIOTECanada and BioAlberta are not associated or related in any way to one another.The Canadian biotechnology and life science sector is one of the country’s fastest growing industries. Canada currently provides a modern, responsive, and efficient regulatory environment for pharmaceutical and biotechnology products. Over 300 biotech companies are spread out across the country and more than 100 operate in the pharmaceutical sector. Of those, 67% are in the discovering or emerging stage of development which indicates that the industry in his infancy. Save the date: A&C team will be in New York City from the 18th to the 21st of March 2019 for the DCAT week. A&C is a longstanding DCAT member and, like every year, we are excited to attend this world renowned event. A&C is looking forward to meeting you at DCAT in New York next month. Quality, Safety, Purity, and Suitability requirements for Pharmaceutical use. Phenoxyethanol, found naturally in green tea, is used as a vaccine preservative and also as an antibacterial API for pharmaceutical preparations. It is produced commercially as a synthetically derived, colourless, and mostly odourless, aromatic alcohol. It is highly valued in pharmaceutical applications due to its low toxicity whilst having excellent bactericidal and bacteriostatic properties. It is effective against a broad spectrum of gram-negative, and gram-positive bacteria, and to a less extent, against yeast and mold. Often it is combined with a second preservative (such as phenol, formaldehyde or benzethonium) to broaden its effectiveness against potential contaminants. One of phenoxyethanol’s strengths is the inability of microorganisms to adapt to its presence, it remains effective. Typical use level in vaccines is approximately 5 mg/ml (0.5%). Phenoxyethanol is stable, non-reactive, and soluble in oil and water. It is recognized world-wide as an effective preservative and has monographs in the European, British and United Sates Pharmacopoeias. Is there a problem with commercial grade Phenoxyethanol? The majority of commercial phenoxyethanol is destined for use in cosmetics, perfumes, dyes, inks and various other personal care or industrial applications. These uses far exceed the quantities destined for Pharmaceutical use. This fact belies an age-old problem for our industry. Phenoxyethanol is a great product with useful activity and an excellent toxicity profile, however, most commercial grades are not manufactured with adequate GMPs for the Pharmaceutical market. The EU and Canada require excipient and API sources to have sufficient quality controls for fitness of purpose of the ingredient source to demonstrate equivalence to strict GMP. They may accept non-GMP sourcing (1) but the onus is placed with the drug manufacturer to take responsibility for and prove through time-consuming process and supply chain risk assessment, correction, approval and change-management that adequate quality controls are in place. The US FDA, on the other hand, notes that ICH Q7 applies to all APIs regardless of origin (2). With this in mind A&C decided to manufacture our own truly GMP phenoxyethanol that will satisfy even the US FDA’s strictest requirement for GMP compliance. A&C produces two grades using the same proprietary fractional process that yields a high purity phenoxyethanol with a superior impurity profile with all manufacturing falling within suitable GMPs for pharmaceutical application. A&C prides itself on strict controls, carries ISO and EXCi-PACT quality certifications, has a Drug Establishment license from Health Canada for manufacturing APIs and is audited by Health Canada and the US FDA. If you use phenoxyethanol for a pharmaceutical application, we believe you should strongly consider our product for assurance it is designed from ‘start-to-finish’ to meet your GMP needs. A&C is delighted to announce that Tríona Lyons has recently joined the company as our Quality Assurance Manager for A&C Bio Buffer Ltd in Ireland. With over 17 years of experience working in the pharmaceutical industry, Tríona will bring great value to the A&C team. She holds a First Class Honours Bachelor of Science degree in Microbiology at University College Cork. Previously, she worked in various global healthcare companies as chemistry analyst, finished product senior analyst, raw materials senior analyst, chemistry group supervisor and technical specialist. We would like to welcome Tríona and wish her the best of luck with her new experience with A&C. A&C would also like to congratulate Jonathan Li who has been promoted and will take on the new position of Quality Control Coordinator at one of our Canadian sites. Jonathan has worked with A&C for thirteen years and has been a valuable member of the Quality Control team. We thank Jonathan for his dedication and hard work and we wish him every success. At the close of another wonderful and successful year for A&C, we gratefully pause to thank you and wish you all a warm and joyful holiday season and every happiness in 2019. We wish to thank all our customers for their continuing support in 2018 and to all our staff for their dedication and hard work. Happy Holiday and a prosperous New Year from the A&C team. The event is only a few weeks away and our team is finalizing all meetings for one of the largest pharmaceutical events globally. With over 40,000 pharmaceutical professionals attending and over 2000 exhibitors from over 153 countries, it should be a very productive few days in Madrid. To ensure we give you enough time and information, we would urge you to pre-book a meeting day and time that are suitable to your schedule at the event. We look forward to meeting you there. A&C was delighted to present the annual Linda Fong Award to Jonathan Li. The Linda Fong Award is an employee award that recognises an individual for hard work and dedication. This is a special award within A&C as it is named after one of our past employees that sadly passed away. Linda worked with A&C for 21 years and we are proud to present this award annually to employees who show strong qualities in memory of her. Jonathan works at A&C as a senior chemist and has displayed great work rate, leadership, and team work. He is richly deserving of the award. From all the team we would like to offer our congratulations to Jonathan. Clayton hotel in Dublin on the 23rd October this year. The event has established itself as the benchmark for excellence for those operating in Ireland’s pharma industry. A&C are delighted to announce we will be sponsoring the “Supplier of the Year” category. A&C are a key supplier to many pharmaceutical and biopharmaceutical companies globally and understand the important role all suppliers in the industry have in developing and maintaining life saving medication. We look forward to the night and meeting our industry peers. The laws on Data Protection are changing on 25th May 2018. As part of the new GDPR Legislation, anyone who receives emailed correspondence must agree to this. At A&C Chemicals Europe Ltd our priority is keeping your data safe, so we have therefore implemented some new practices to comply with the new GDPR laws. At A&C Chemicals Europe Ltd we do all we can to respect your right to privacy and the protection of your personal information. This is a summary of what we do with your information in order to run our business and provide our customers with products and services. We collect your name, billing address, contact numbers and email addresses in order to process your orders and any account you have with us. Occasionally we collect a delivery address if different to your billing address. This information will have been given to us voluntarily by you ahead of any order you have made being fulfilled. stop sending you marketing material; or send some of your data to someone else for them to use. We use your information solely to provide you with products and services that you have requested. We will not share your information outside of our business unless otherwise ordered to by you or if we need to and we have sought your permission to do so. Your information will not be transferred to a third party. We engage in a company Newsletter which anyone can subscribe or unsubscribe to. We will store your information until you tell us not to. We will store a record of your orders for up to ten years in case we need to recall the information for any reason. We are committed to ensuring that your information is secure with us. Your information is stored centrally on the premises with only the Office Staff having access to the facilities wherein your information may be stored. To comply under the new GDPR regulations, we require you to give your consent for us to hold your data as of 25th May 2018. If, however, this is not your preference, we would be most grateful if you could UNSUBSCRIBE using the link below. Any questions please feel free to contact a member of our team. Did you know that A&C are on LinkedIn? Please give A&C a follow on our LinkedIn page to keep up to date with all the current news and developments at A&C. CPhI North America is around the corner and the A&C team are very excited to participate at the show on April 24th-26th 2018. There is a high turnout at this event every year with an estimated 6000 Pharmaceutical professionals and over 400 exhibitors expected to attend. We would advise you to pre book with us in advance to ensure that our team are available at a suitable time. For USA customers, please contact our Business Development Director Rob Tyler at usa@acggp.com or +1 301 928-9634. For Canadian customers, please contact Estefania Bertaina at ebertaina@acggp.com or +1 514-928-8891. Our team are looking forward to meeting you there at Booth 628. If you require free tickets for the show, please contact a member of our sales team for the entry code to register online for free. A&C are delighted to welcome Jean-François Raymond to A&C as our Quality Director. Jean-François is a great asset to the A&C team with over 20 years experience working in diverse areas in the pharmaceutical sector. Jean-François will be responsible for managing the Quality Department across all of A&C’s sites. In his previous position, Jean-François held the Director of Quality position for a global healthcare company. He holds a M.Sc. in Biology at Université Laval in Quebec, Canada. A&C would also like to congratulate and recognise staff members who have been recently promoted to new positions within the business including Shu Fang Gao to Quality Assurance Manager, Alexandre Morissette – to Production and Project Manager and last but not least Avram Petrean to Quality Control Manager. We wish them all continued success in their new positions. A&C are delighted to relaunch our Twitter Page (@acggp). Please give A&C a follow for all the latest news and developments in the pharma and related industries. A&C are delighted to announce our participation in DCAT’s annual event ‘DCAT Week’ in New York City on March 19th-22nd 2018. DCAT is a renowned business event for companies in the pharmaceutical development and manufacturing sector. The Drug, Chemical & Associated Technologies Association (DCAT) provides companies the opportunity to meet with main decision makers in sourcing, procurement and supply management. A&C are a DCAT member and have participated at the event for over 10 years and look forward to networking with all our current customers and Industry peers. For our American customers, please contact Rob Tyler Business Development Director to arrange a meeting: usa@acggp.com or call Rob on +1 301 928-9634. For our European customers, please contact Gearoid O’Rourke Sales & Marketing Director on euro@acggp.com or call Gearoid on +353 87 2500956. Everyone at A&C celebrated a very successful 2017 and a promising 2018 at the New Year Staff Party at the delightful Mundo Trattoria in Montreal Canada. A&C staff members proudly hailed their 2017 achievements which helped A&C attain more business and better serve existing customers throughout the year. A&C would like to thank all their staff for their dedication and hard work during the year. From left to right: John O’ Dwyer, Jimmy Feehan and Kieran Bergin. A&C’s European headquarters were delighted to sponsor Killenaule GAA coaching day with Tipperary GAA inter-county hurling stars John O’ Dwyer, Jimmy Feehan, Kieran Bergin and Cathal Barrett, along with Paudie Feehan Tipperary senior footballer and Killian Dwyer Tipperary under 21 hurler. Great turnout at Killenaule GAA coaching day with over 250 children participated in the special coaching camp. A team of researchers at the University of Maryland School of Medicine (UMSOM) has been assessing the effectiveness of a single high-dose live vaccine in the treatment of cholera, as opposed to the traditional two-dose inactivated vaccine approach, with the hope of more successfully protecting vulnerable populations in large, recent outbreaks of the disease. The team studied the effectiveness of a single, high-dose of CVD 103-HgR in 150 in stimulating vibriocidal antibody, an immune response in the body which correlates with protection against the disease. The therapy was developed by UMSOM’s Center for Vaccine Development and manufactured by PaxVax. The team’s findings suggested that delivering vaccines this way rather than the traditional method may be more effective in rapidly providing protection in large outbreak situations. The team are now investigating whether this method of vaccine delivery can neutralise cholera outbreaks early through prompt administration, or even if it can be used pre-emptively to minimise expected seasonal increases of the disease. They are also looking into how the treatment can be used to better protect children under five years old who are one of the most high-risk groups. These findings are particularly poignant given the ongoing conflict in Yemen, which the WHO estimates is experiencing the worst outbreak of cholera in modern times. There are over three million cases of Cholera worldwide each year, especially across Africa, Asia and the Caribbean where the disease is endemic, and can lead to death from dehydration in severe, untreated cases. CPhI Worldwide is only a few weeks away and our team are finalizing all meetings for one of the largest pharmaceutical events globally. With over 40,000 pharmaceutical professionals attending and over 2000 exhibitors from over 153 countries, it should be a very productive few days in Messe Frankfurt, Germany. To ensure we give you enough time and information, we would urge you to pre-book a meeting day and time that is suitable to your schedule at the event and we look forward to meeting you there. CPhI North America is only a few days away and our team are finalizing all meetings for this historic event. With an estimated 6000 Pharmaceutical professionals expected to attend and over 400 exhibitors at this inaugural event, it should be a very productive few days in the Pennsylvania Convention Center in Philadelphia. To ensure we give you enough time and information, we would urge you to pre-book a meeting day and time that is suitable to your schedule at the event and we look forward to meeting you there. Please follow the link to register for free for CPhI North America. CPhI North America is only a few weeks away and our team are finalizing all meetings for this historic event. With an estimated 6000 Pharmaceutical professionals expected to attend and over 400 exhibitors at this inaugural event, it should be a very productive few days in the Pennsylvania Convention Center in Philadelphia. To ensure we give you enough time and information, we would urge you to pre-book a meeting day and time that is suitable to your schedule at the event and we look forward to meeting you there. A&C is delighted to announce our continued participation at DCAT Week in New York City from Monday to Thursday, March 20th to 23rd, 2017. DCAT Week is the premier business development event for companies engaged in pharmaceutical development and manufacturing, as well as other related industries. It is hosted by the Drug, Chemical & Associated Technologies Association (DCAT) to assist its member companies with their business development objectives. Held annually in March, the event’s unique model brings together members for high-level strategic meetings with key decision makers, timely educational programs and important networking opportunities. A&C will have a large team at the event, so if you wish to set up a formal meeting, an informal coffee or meet us for a drink at the DCAT Annual Dinner, please contact us directly. A&C is very pleased to welcome Avram Petrean to the A&C family. Avram’s position within the A&C global group is “Quality Control Supervisor” based in our headquarters in Montreal and is a positive addition to our continually growing quality assurance group. Avram brings a wealth of knowledge with over 12 years of experience in the pharmaceutical industry in Canada. Previously, Avram was Assistant Professor of Organic Chemistry in Romania and holds a PhD in Chemistry from the University Montpellier II (France). Avram is and has been a member of the Order of Chemists in Quebec since 2005. A&C is delighted to announce the introduction of its latest product offering 2-Phenoxyethanol as an API. 2-Phenoxyethanol API is used with other products as a repeated, temporary preparatory antiseptic for mucous membranes and adjoining skin before diagnostic procedures. It is also used for antiseptic treatment of small superficial wounds and skin disinfection prior to non-surgical procedures. 2-Phenoxyethanol is also available as an excipient. 2-Phenoxyethanol is used in various applications as a preservative in many dermal applications and as a preservative in multi-dose vaccine vials. CPhI North America is only a few months away and our sales team is in full preparation for this historic event. A&C will have a booth at this inaugural event at the Pennsylvania Convention Center in Philadelphia from May 16th to 18th, 2017 and we would be delighted to meet you there. To ensure we give you enough time and information, we would urge you to pre-book a meeting time that is suitable to your schedule at the event. Because the foundation of our success is the goodwill of those we serve, it’s a real pleasure at this Holiday season to say “thank you” as we wish you a full year of happiness and success. 2016 has been an exciting year of domestic and international growth for A&C and we look forward to serving you, our valued customers, in 2017. Have a Happy Holiday and a prosperous New Year from the A&C team. A&C is delighted to announce that it will be exhibiting at the first ever CPHI North America. This inaugural event will take place on May 16-18, 2017 at the Pennsylvania Convention Center in Philadelphia, PA, USA. A&C’s US Business Development Manager, Rob Tyler, stated “Our business has grown significantly in the U.S. and Europe over the last five years and we are projecting this growth to continue”. We feel CPHI North America will be a great place to meet many of our existing customers and introduce our capabilities, products and services to new customers. A&C Canada is very pleased to welcome Estefania Bertaina to the A&C family. Estefania joins us as our Account Manager for the Canadian market. Estefania brings a wealth of sales and marketing experience within related industries, including pharmaceuticals. Estefania will help develop new accounts and provide additional support for our existing clients by offering custom solutions for our clients’ specific products and quality objectives. She will showcase all our products which include custom excipients, process solutions, buffers and API’s suitable for pharmaceutical, biopharmaceutical, laboratory and research applications. Estefania will be located in Montreal, Québec and can be reached directly at 514-928-8891 or ebertaina@acggp.com. Please join us in welcoming Estefania to A&C! In general, A&C will produce products meeting the appropriate compendia and wherever possible a Multi-Compendial material will be made available. This could include USP-NF, EP, JP, or JPE. The expectations and requirements of these compendia require that the materials are manufactured under Good Manufacturing Practices (GMPs). Testing non-GMP material to the compendia’s specification does not make it a Pharmacopeial Grade material. GMPs must be followed and evaluated to truly manufacture a Pharmacopeial Grade material. So what happens if the Pharmacopeia doesn’t have a monograph? The Pharmacopeias recognize they do not have a monograph for every Excipient used in formulations. They are working on strategies to include more materials, but these are time-consuming endeavors. FDA expects that materials chosen for use are in the Inactive Ingredient Database (IID). Therefore, there are situations requiring the use of materials that there is no Pharmacopeial Monograph available. In this case A&C will work to establish an A&C Pharma Grade material. A&C Pharma Grade is available to assist customers in compliance with regulatory compliance. The time-frame to develop these products is 6-18 months depending on the complexity and availability of validated methodology. A&C Pharma Grade materials will provide you the control needed because all of A&C’s Pharma Grade materials are manufactured under GMPs in Montreal, Quebec. Examples of these type of products include, Levulinic Acid, Toluene, Cyclohexanse, 5 N HCL. Please contact A&C if you have a product that will require A&C’s assistance. 2016 has been a very exciting year for A&C, with the beginning of construction of its second manufacturing site in Montreal and continued global expansion with offices in USA, Asia and Europe. A&C are delighted to announce that a number of new positions have been filled in Canada in the last two months. These positions are across departments including Sales, Quality and Production and have been created due to increase in business. A&C will also be looking for a number of employees in early 2017 across various sectors in Montreal in conjunction with the opening of our new GMP manufacturing facility. In Europe, A&C will also be looking to fill a number of positions in 2017 including, GMP production, quality assurance and administration. A&C certified by EXCiPACT and Health Canada- why? If A&C is audited by Health Canada, then why did A&C choose to be further certified to EXCiPACT GMP and GDP standards? A&C is a manufacturer of excipient’s, process solutions, buffers and API’s. A&C is audited by Health Canada to show compliance in our manufacturing, packaging, labeling, and distribution of Active Pharmaceutical Ingredients. Health Canada had to limit its scope of their audit to API’s. A&C wanted third party quality standard recognition for manufacturing excipient, buffer and process solutions, to show our customer’s the commitment A&C have to maintaining the highest industry quality standard. The EXCiPACT Certification Scheme is a credible, high quality, 3rd party international certification scheme for manufacturers, suppliers and distributors of pharmaceutical excipients to show compliance to GMP and GDP best practice. A&C were the first North American manufacturer to receive this accreditation in 2014. We value the independence and transparency EXCiPACT Certification provides. In early September the auditors came to A&C for re-certification. We are delighted to announce we have just received our certification again. Upon request, customers can receive the audit report. A&C were delighted to be part of Ireland’s first Biopharmaceutical conference held in Dublin, Ireland on the 21st and 22nd of September 2016. The Irish Pharmaceutical Healthcare Association and BioPharmaChem Ireland, representing the research based and manufacturing biopharmaceutical industries respectively, came together with the National Institute for BioProcessing Research and Training to host BioPharma Ambition®, a multi-platform event to inspire and showcase innovation in the sector for Ireland globally. With international policy leaders, renowned researchers and senior industry personnel, the event highlighted the ambition of the industry for the health and well-being of populations. It also highlighted where the research is pointing and how Ireland will support innovation in discovery, development, manufacturing and healthcare solutions. A&C is proud to be celebrating 50 years of servicing the Life Science industry. We would like to express our gratitude to you for your loyalty over the years and your continued confidence in our business. In addition, we are pleased to share with you our updated branding which we feel reflects the evolution of today’s A&C. 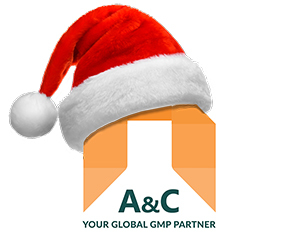 We will now be known as “A&C Your Global GMP Partner” with a fresh new logo and website to complement these changes. Our fresh new logo is our way of updating our image to capture our history and to better reflect our future. Our tag line “Your Global GMP Partner” outlines our commitment to quality, transparency, flexibility and a strong consultative partnership. Customers can be assured that we fully understand change control and even a simple logo change can have an impact. As such, any items impacted by our new logo will be addressed as per cGMP requirements with the proper change control notification and a targeted implementation date of 18 to 24 months. More information on this element will follow. While our logo may be different, what will not change is the standard of customer care and product quality which you have come to associate with us. We have developed an attention to detail and a strong sense of our customer’s needs in our 50 year history. A&C will remain leaders in customer service, quality, supply chain transparency and product documentation. As such, our customers can continue to expect the highest standards of excellence and trust in our brand. A&C is pleased to announce today it has begun construction on a new manufacturing and storage facility in Baie D’Urfé, Quebec. The new site will increase the capacity of our high purity pharmaceutical excipients, buffers, process liquids and API’s to support our continued growth in Canada, USA and Europe. The new facility will include a new state of the art buffer, process liquid and powder processing suites including warehousing that will meet and exceed cGMP Health Canada and FDA requirements for both Active Pharmaceutical Ingredients (API’s) and excipients used in pharmaceutical and biopharmaceutical manufacturing. The facility will be completed and commissioned during the fourth quarter of this year and will add significantly to our capacity. We see this as a major commitment to our business to ensure a reliable supply to our valued partners in the pharmaceutical and biopharmaceutical industries. This investment will give A&C capacity and redundancy to serve our growing global customer base that is now serviced through key strategic locations in Canada, USA, and Europe. Our customers can be assured that any products that will be affected will be addressed as per the cGMP requirements with the proper change control notification. It is A&C’s intention to qualify the new facility as a secondary manufacturing location prior to any change. This will ensure and further support A&C’s business continuity plan and help us service our customers for years to come. A&C welcomes any audit requests which are now being scheduled for January 2017. In line with our core values, this process will be conducted with complete transparency to ensure our customers are part of the process. We look forward to providing further updates in the coming months. We at A&C are delighted to announce our new corporate website www.acggp.com in conjunction with our new logo. The primary objectives of our site development effort were focused on aesthetics, simplifying our content, and increasing the visibility of our products and services for the Pharmaceutical and biopharmaceutical markets. Along with enhanced navigation and usability, the new website will ensure each visitor will be up to date with the latest news and announcements from A&C through the company newsletter and social media tools. Our website is designed with specialized functionality to allow our customers access to our full database of products through CAS number or product name. The website will highlight products by product category allowing our customers to download relevant documentation in real-time. Our customer service team are always on hand if you cannot find the product you are looking for as detailed on the new website are many of A&Cs unique services such as custom bespoke products and custom packaging. A&C Your Global GMP Partner is pleased to announce that 2016 marks the 50th year of continuous operation of the business. Incorporated in March 1966 as a laboratory chemical manufacturer it has grown from its modest beginnings to a Global GMP excipient, buffer, and API manufacturer that services the pharmaceutical and biopharmaceutical industries. When founded, A&C found that the lack of control and purity in many of the chemicals on the market created challenges for chemists and pharmacists. This was to be the catalyst for the company’s growth and success to this day where our brand continues to stand for Quality, transparency and flexibility. We would like to thank our many customers worldwide for their support and business over the last fifty years and look forward to working with them in the future.